Buy FOUR 20-LB. 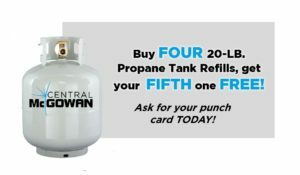 Propane Tank Refills, get FIFTH one FREE! Compliments of Central McGowan. Ask for a punch card at your next visit.